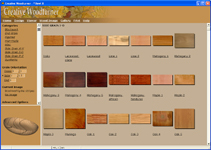 The design page is where you draw your woodturning. 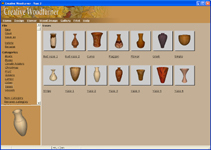 Creative Woodturner has many features specifically for woodturning, making it excellent for designing all types of woodturnings. Designing is quick and easy because the design page automatically mirrors the woodturning about the centre axis. 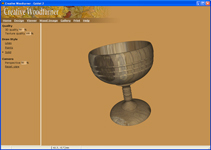 You draw your woodturning using the mouse with either straight or curved lines. 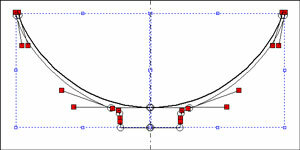 You simply select either the straight or curved line tool, then click-and-drag to design the shape of your woodturning. When you have placed lines, you can adjust them using the modify tool. You can add as many lines as you want, so you can design woodturnings that have as many beads, coves and details as you want. 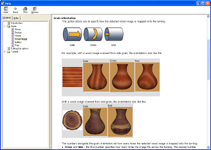 A photo-realistic image of your woodturning is shown in the corner of the screen and is updated as soon as you modify the design, showing you the effect of your changes immediately. The 3D view can be rotated and zoomed, allowing you to look at your design from all angles. 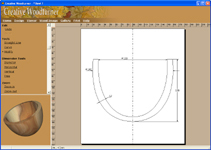 The design page has rulers to help you correctly scale your woodturning. 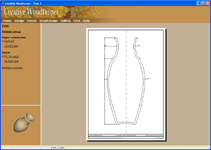 The modify tool is used to modify the straight or curved lines of your woodturning once they have been drawn. 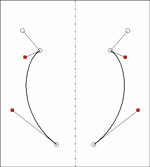 Each line has control points which are moved with the modify tool to adjust the lines. The modify tool is also used to move and scale many lines together. You can add dimensions to your woodturning to use when you are at the lathe. 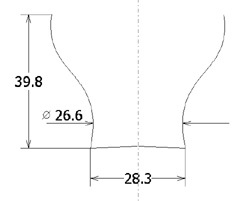 The dimensioning tools can add diameter, horizontal, vertical and free dimensions. The number of displayed decimal places can be changed, and metric or imperial units can be used. The zoom tools allow you to zoom in and out, giving you the ability to work on close-up detail and also see the overall shape of your woodturning. The fit to page option will scale the woodturning to fit onto the screen.